Artificial Intelligence is greatly expanding its applications in almost every possible sector. As a result, machine learning has started to take a step forward in many streams including those of Big Data and Analytics. The ultimate scenario is where machine learning can correctly foretell solutions to the forward-looking businesses and unveil patterns that are never seen before. The enterprises are also leveraging big data as a strategic asset which is reflected in the aggregate experience of an organization. 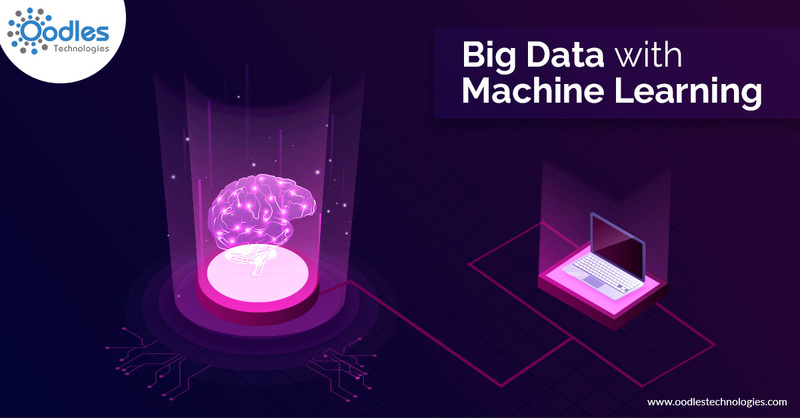 Moreover, with all of these innovations shaping up the technological arena, the true possibilities of big data can be visibly observed with machine learning. So let us dig a little deeper into the topic and see what is it really all about. Big Data With Machine Learning: How? When it comes to Big Data, the real potential and opportunity of enterprises lie in the advanced data analytics, especially in the field of machine learning. With this technique, big data can be mined to reveal business insights automatically and build predictive models. However, maintaining and gathering huge chunks of data is a task, but extricating important information from these clusters is even more tedious. Big Data not only transforms the methods one can implement for predictive analysis, but it also alters our whole thought process about knowledge interpretation and extraction and simultaneously appends a new aspect to it. Machine Learning is a primary tool in building a space that can react and sense to distributed, dynamic situations. The number of factors and variables that can be put into contemplation by following this methodology is however unlimited. It molds together a real-time data collection with the mechanization of business procedures, and is specifically devised to deal with disparate, complex data sources and the multitude of variables involved in data sets that are diverse, large, and continuously changing. In simpler words, machine learning is primarily drilled to handle big data. One one hand, traditional analytics are constrained by data volume and the requirements for human interaction to avail program execution whereas machine learning furnishes accuracy, speed, and scalability to essentially unleash the potential of big data. The reverberations of machine learning on big data is notable and is significant in two elementary ways. The first is in enabling data scientists to be more capable of processing and analyzing the variety, volume, and velocity of both structured as well as unstructured data. The second is in unleashing the latent parameters and patterns that the data scientists might have overlooked. With this type of potential put into the big data mining, enterprises will, therefore, have an improved opportunity to deliver the promises of big data, and effectively monitor the ROI on their project investments. While data scientists might have leveraged the benefits of machine learning for quite a long time, the future of big data with machine learning basically lies in furnishing this technology in the area of enterprises and business users. What are your thoughts about it? Let us now by writing down in the comment section below.